Selective Catalytic Reducers - BORN Inc.
Reduce peak temperatures of the flame zone. Reduce gas residence time in the flame zone. Reduce oxygen concentration in the flame zone. These changes to the combustion process can be achieved by either modification of operating conditions on existing furnaces, or purchase and install new low NOx burners or furnaces. Reduce peak temperatures by using a fuel-rich primary flame zone increasing the rate of flame cooling decreasing the adiabatic flame temperature by dilution. Reduce the gas residence time in the hottest part of the flame zone by changing the shape of the flame zone using the steps listed in Strategy 1. Reduce the O2 content in the primary flame zone by decreasing the overall excess air rates controlled mixing of fuel and air using a fuel-rich primary flame zone. This is a simple yet effective technique. Forty years ago it was not uncommon to see furnaces operating with 50-100% excess air. (Excess air is the amount of air in excess of that stoichiometrically required for 100% combustion; 50% excess air corresponds to a stoichiometric ratio of 1.5 or an equivalence ratio of .667.) As fuel prices escalated, the percent of excess air (EA) was decreased to about 15-30% to save money. This level of EA was considered a practical limit because it gave good combustion but did not require extensive furnace monitoring. Owing to less than perfect mixing of air and fuel, there must be some EA present at all times to ensure good fuel use and to prevent smoke formation. In recent years, development of advanced instrumentation has allowed continuous automatic furnace monitoring and control of EA, and the percent EA can now be reduced below the 10-30% limit. The EPA conducted tests on various boilers with various fuels. The results indicated that a 19% average reduction of NOx (from 495 ppm to 408 ppm, dry basis, corrected to 3% O2) can be achieved by reducing the percent of excess air from an average of 20% to an average of 14%. Often called staged combustion, this combusts the fuel in two or more steps. The initial or primary flame zone is fuel rich, and the secondary and following zones are fuel lean. Without retrofitting with specially designed burners, OSC can be accomplished (a) by firing some of the burners fuel rich and the rest fuel lean, or (b) by taking some of the burners out of service and allowing them only to admit air to the furnace, or (c) by firing all of the burners fuel rich and admitting the remaining air over the top of the flame zone (overfire air). In a test of 31 boilers burning coal, oil, or gas, NOx emissions were reduced an average of 34% using Method (b). Careful monitoring of the flue gas is necessary with this method to protect against CO formation and furnace smoking. This is simply the rerouting of some of the flue gas back to the furnace. The quenching effect from the CO2 rich flue gas lowers the O2 concentration in the combustion zone. In retrofit applications FGR can be very expensive. In addition to requiring new large ducts, major modifications to the fans, dampers and controls might be required. Furthermore, the additional gas flow through the firebox and flues might cause operating and maintenance problems. FGR is usually better applied to new designs than to existing furnaces. 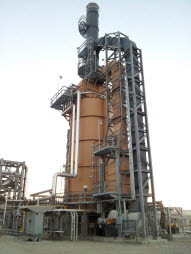 This involves the injection of natural gas or some other fuel into the furnace above the main burners at a rate equal to about 10-25% of the total heat input. This creates a fuel rich “reburn” zone in the in the middle of the furnace above the primary combustion zone. NOx laden combustion gases from the primary zone flow into the reburn zone and mix in the fuel rich environment with the reburning gases. The reburn fuel does not form a well defined flame, but rather burns uniformly throughout the zone. Hydrocarbon radicals (formed as intermediates of the rich combustion process) react with the NOx from below and chemically reduce the NOx to molecular nitrogen. The combustion process is completed in a burnout zone above the reburn zone where fresh air is injected to complete the oxidation of the remaining hydrocarbons and CO. Pilot and full scale tests cosponsored by the Electric Power Research Institute indicate that reburning can reduce NOx emissions by 40-60% without increasing CO emissions. This technique can only be applied to furnaces tall enough to provide sufficient residence time (1.5 seconds) for both the reburn and the burnout processes to be completed. Reburning is the primary NOx control technique for “cyclone” type coal fired boilers. This lowers peak temperatures in the flame zone, thus reducing thermal NOx. However, unless an alternative means of recovering heat is available, a substantial overall energy penalty results. A similar statement can be made for reduced firing rates. By reducing the firing rate (derating the furnace), the heat release per unit volume, or combustion intensity, is reduced. Reducing the firing rate generally reduces thermal NOx formation, but creates several problems. Besides the obvious penalty of reducing unit capacity, low load operation usually requires increased excess air to control smoke and CO emissions. Also, operating flexibility is reduced. This can be an effective means of reducing flame temperatures, thus reducing thermal NOx. Water injection has been shown to be very effective for gas turbines, with NOx reduction of about 80% for a water injection rate of 2% of the combustion air. The energy penalty of a gas turbine is about 1% of its rated output, but for a utility boiler, it can be as high as 10%. New low NOx burners represent the most common equipment design change for reducing NOx formation. Low NOx burners are not only effective on new power plants, but also can be readily applied to older facilities as retrofit projects. Basically, low NOx burners inhibit NOx formation by controlling the mixing of fuel and air. Different burner manufacturers use different hardware to control the fuel air mixing, but all designs essentially automate two effective tactics already described: LEA and OSC. Low NOx burners reduce NOx emissions by 40-60% compared with older, conventional burners. Acceptance of low NOx burners in industry has been good. In fact, low NOx burners are now a standard part of new designs. However the largest percentage of utility coal fired NOx emissions are from plants built prior to 1971. These older plants are not now regulated, but many of them could be retrofitted with low NOx burners for a significant overall reduction in U.S. NOx emissions. Burner spacing can also affect NOx formation. In a large power boiler, there may be fifteen to twenty burners on the front wall. With all the flames merging because of tight spacing, higher temperatures (hence, greater NOx formation) result, especially in the central portion of the burner matrix. In newer designs, greater distances between burners are being provided. This strategy produces less interaction among flames, and more radiant cooling of individual flames. Furnaces themselves are being designed in larger sizes. Larger furnaces inhibit NOx formation in similar ways as increased burner spacing. Larger enclosures provide more time for complete combustion using off stoichiometric combustion burners. Also, larger enclosures provide more tubes to achieve the same amount of heat transfer from lower temperature flames. Finally, larger enclosures, reduce turbulent mixing of the fuel and air, which also inhibits NOx formation (particularly fuel NOx). This is NOx formed by nitrogen atoms that are chemically bound in the fuel. Liquid fuels almost always contain some nitrogen, and as a rule, liquid fuels make more NOx than burning gases. Generally single nitrogen atoms are the most reactive. Amines and ammonia in the fuel contribute greatly to fuel NOx formation. Thermal NOx is the reaction of N2 with oxygen in the flame front of a burner. High flame temperatures contribute to thermal NOx formation. The original low NOx burners were designed with staged air (as opposed to the current technology using staged fuel). Staging either the air or the fuel accomplishes the same end result: a lowering of the flame temperature to reduce the formation of thermal NOx. Flue Gas Recirculation (FGR), is another technique for reducing the formation of Thermal NOx. is where a portion of the CO2 rich flue gas is recirculated and injected back into the burner along with the primary combustion air. The quenched flame tends to be a lazy, longer, and cooler flame that is lower in themal Nox. Fuel Nox is formed by direct reaction with nitrogen chemically bound in the fuel with oxygen during combustion. Modify the combustion processes to prevent the formation of NOx. Treat the combustion gas chemically, after the flame, to convert the NOx to N2. Reactions (2) – (4) can be carried out over a zeolite catalyst at 700°F to 800°F. 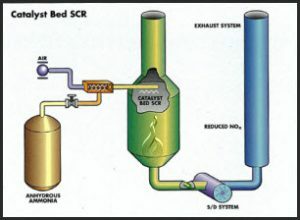 This catalytic process has been employed on a large scale and gives up to 85% reduction in NOx. 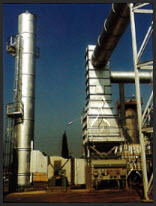 The first successful commercial NOx SCR system was built by Hitachi Zosen in 1975. Since then, the technology has become well established world wide. The catalyst used is a honeycomb shaped metal or ceramic plate with active sites made up of a mixture of titanium and vanadium oxides. The catalysts are selective to optimize NOx activity and minimize SO2 oxidation. The honeycomb shape is desirable to minimize plugging if particulates are present. The best temperature range for SCR catalyst activity and selectivity is from 700 o to 800°F. Ammonia is injected downstream from the combustion zone and upstream of the catalyst. In process heaters the catalyst undergoes slow deactivation over a long period of time. The thickness and hence the space velocity of the honeycomb blocks is typically specified for a three year life. As the activity of the catalyst decreases, the amount of excess ammonia required for the desired conversion increases. Maximum allowable ammonia “slip” is specified when the catalyst is purchased. Ammonia slip of 10 ppm is typical. The catalyst is manufactured in blocks that are held in place in the stack gas ductwork by a stainless steel T-bar grid. The ammonia is injected upstream of the catalyst grid through its own injection grid in a turbulent zone. Anhydrous or aqueous ammonia can be used, depending on the policies of the plant where the system is to be installed. In the case of aqueous ammonia, the material can either be vaporized first and injected as a vapor, or in some duct configurations, it can sprayed in through an atomizing spray nozzle. SCR catalyst substrate is recyclable and can be regenerated by the manufacturer if it has not been deformed or damaged by heat. Most often a spare charge is kept on hand for changeout during routine turnarounds and the spent material is sent in for regeneration. There is about a 30% cost savings in reusing the substrate over a new purchase and it eliminates catalyst disposal cost concerns. At BORN, we have a detailed understanding of combustion emissions and can design the most technically effective application to suit your process requirements and meet the most stringent regulatory requirements. BORN ensures that each technical solution is carefully selected after a detailed review of our client’s specific application and regulatory requirements. Born is the world's leading supplier of direct fired process heaters and associated process plant and equipment, offering comprehensive engineering, procurement, inspection, installation and commissioning services, together with full after sales support. BORN is committed to a continuous policy of Innovative Design, Product Development and Commitment to Quality that ensures every BORN installation precisely meets the Client's Specifications as well as the highest Industry Standards. A BMS, or Burner Management System, for a fired heater is a skid mounted valve, piping, and logic safety system used to control when fuel gas is allowed to flow to the heater burners and pilots. 2017 Born Inc. Hosted by Jackson Technical.